Genera 3, species 60. The sap of several species of the maple yields sugar by evaporation. (4 - 9)-petaled or 0; stamens 8 (4 - 12); styles 2; samara) 2-winged, united at base, by abortion 1-seeded. - Lvs. simple, palmately 5-lobed. 1 A. rubrum L. Red Maple. Swamp Maple. Lvs. cordate at base, acutely and incisely toothed, the sinuses acute, glaucous beneath; pedicels elongated in fruit; petals-linear oblong; ovaries and fruit smooth. - Common in low woods and swamps throughout the country. It is commonly of smaller dimensions than the sugar maple, but sometimes far exceeds it. Specimens at Montezuma, Ind., on the Wabash river, measure about 80f in height with a trunk 17f in circumference. Bark rather smooth, becoming dark gray and broken with age. In early spring it puts forth its deep crimson flowers in dense fascicles (about 5 from each bud). Stamens 4 times as long as the petals. The fruit has its wings 1' long, at first incurved, finally divergent, mostly red. The leaves vary greatly in form and pubescence, sometimes quite woolly beneath. Curled maple is a variety of the wood of this species, much prized in cabinet-work. 2 A. dasycarpum. Ehrh. White Maple. Lvs. truncated at base, unequally and incisely toothed, with rather obtuse sinuses, white and smooth beneath; fls. in crowded, simple umbels, with short pedicels and downy ovaries; petals 0. 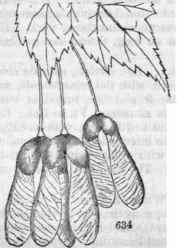 - This species much resembles the last, but its leaves are larger, more pointed, and whiter beneath, and the winged fruit is also larger than that of the red maple or of any of the following species. It is a tall tree, 50f in height, not uncommon in the N. Eng. forests. The flowers are of a yellowish-green color, as also the fruit. The wood is white, softer and less esteemed than that of other species. The sap yields sugar in smaller proportions than the sugar maple. 3 A. saccharinum L. Sugar Maple. Rock Maple. Lvs. subcordate at base; acuminate, remotely toothed, with rounded and shallow sinuses, glaucous beneath; fls. pedunculate, pendulous. - This fine tree is found throughout U. S., but most abundant in the primitive soils of N. Eng., constituting the greater part of some of its forests. It is a tree of lofty proportions, 70f in height, with a trunk 3f diam. The bark is of a light-gray color, rough and scaly. The branches become numer-rous and finely ramified in open situations, and in summer are clothed with a foliage of uncommon luxuriance and beauty, on which account it is more extensively cultivated as a shade tree than any other, not even excepting the majestic and favorite Elm. Maple sugar, perhaps the most delicious of all sweets, is mostly the product of this species. An ordinary tree will yield 5 to 10 pounds in a season. The wood is very strong and compact, and makes the best of fuel. It is sometimes curled like the red maple, but oftener presents that beautiful arrangement of fibre, called bird's-eye maple, which is highly esteemed in cabinet-work. The flowers are exceedingly abundant and suspended on long, thread-like pedicels, and delicately beautiful. Apr. 4 A nigrum. Mx. Black Maple. Sugar Tree. Lvs. cordate, with the sinus closed, lobes divaricate, sinuate-dentate, paler beneath, with the veins beneath, and the petioles pubescent; fls. on long, slender pedicels; fr. glabrous, turgid at base, the wings diverging. - A large tree, in mountainous situations, Vt. to Ind. Resembles the last, but is probably distinct. Trunk 30 to 70f high, with a shaggy bark. Lvs. 3 to 5' diam., dark green above, the two interior lobes much smaller. Fls. pendulous, on long peduncles, yellowish. Fr. with wings 1' in length, pale-yellow, and more diverging than A. saccharinum. The sap, like the last mentioned tree, yields sugar abundantly. Apr. 5 A Pennsylvanicum, L. Striped Maple. Whistle-wood. Lvs. with 3 acuminate lobes, rounded at base, sharply denticulate, smooth; rac. simple, pendulous. - A small tree or shrub 10 to 15f high. Can. to Ga. and Ky., but most abundant in our northern woods. The bark is smooth and beautifully striped lengthwise with green and black. Fls. large, yellowish-green, succeeded by long clusters of fruit, with pale-green wings. The smaller branches are straight and smooth, easily separated from the bark in spring, and are often manufactured by the boys into certain wind instruments. Hence it is called whistle-wood. In Europe it is prized in ornamental gardening. May. (A. striatum Lam.) 6 A. spicatum Lam. Mountain Maple Bush. Lvs. acute, dentate, pubescent beneath; rac. erect, compound. - A shrub of smaller stature than the last, found in mountain or hilly woods throughout the country. The bark is a light gray. Lvs. small, rough, divided into 3 or 5 lobes, which are somewhat pointed, with large, sharp teeth, and more or less cordate at base. Fls. greenish, numerous and minute, in cylindric, oblong, close clusters, becoming pendulous with the winged fruit. Jn. 9 A. circinatum Ph., with cordate, 7 to 9-lobed lvs., and pedunculate corymbs of flowers, from Oregon. A beautiful tree. 2. NEGUNDO, Moench. Box Elder. Ash Maple. Flowers ; corolla 0; flowers racemed, fascicled; calyx, stamens and fruit as in the last genus. - Lvs. compound, pinnately 3 to 5-foliate.